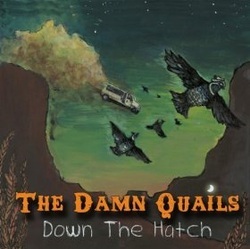 Apparently the Damn Quails are predominately a live band, with the core being two singer songwriters, Bryon White and Gabriel Marshall. The rest of the band seems to be anyone available on their regular Monday night residency at a bar in Norman, Oklahoma! Both are excellent songwriters with totally different vocal styles, Bryons being smoother whilst Gabriel has plenty of rough edges but both have plenty of character and are easily distinguishable on this pretty good fourteen track debut album. There is an even split in the number of lead vocals and neither seems to seek or gain an advantage over the other in songwriting or vocals. The harmonies are always good with the two different vocal styles working well together although this is not a harmony heavy album. There is some excellent playing on the album and the instrumentation, as can be expected from producers Mike McClure (The Great Divide) and Joe Hardy is well thought out and atmospheric, although the songs that have more of a country feel do come across as stronger. This is the majority of songs, although there are several that could probably be classed as pop/rock and as a consequence are less memorable, with these including the pleasant mid-tempo pop/rock of Marshall’s So long ago and the ballad Mary, on which White takes the lead. There are several pretty good country rockers including Better place to stop with it’s driving banjo, the ‘Pocoesque’ Midnight swagger with Another story, Fools gold and California open invitation also being worthy of mention in the country rock stakes. Through the fire is reminiscent of John Prine and album closer Dollars is an excellent country/folk morality tale! Me and the whiskey is a tremendous dark, fiddle and electric guitar driven haunting bluesy ‘loser’ song with Iceman matching this darkness on a hauntingly atmospheric fiddle driven murder song. All in all a very good debut by two men with differing styles within the mainly roots genre, but thanks to their musical skills and some excellent production they manage to blend a few diverse elements into a fairly cohesive whole.